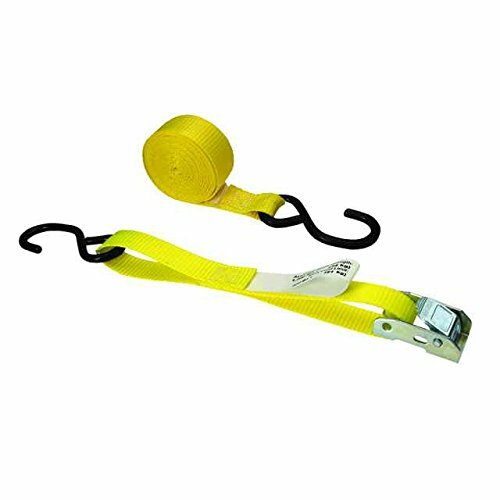 This durable 1-inch Cam Buckle Strap, or â€œpull through" strap, from US Cargo Control is a versatile tie down tool that will work for any lighter duty application on a flatbed trailer, pickup truck, van trailer, or moving truck. The yellow, industrial grade polyester webbing is 20 feet long and resistant to weathering, corrosion, and abrasion damage. A cam strap is a great option for tying down delicate cargo because you simply pull it snug to tighten. (Whereas a ratchet can crush cargo if you continue ratcheting after the strap is snug). This strap has vinyl coated S-hook end fittings, which provide a secure hold but will never scratch your cargo and will not rust, unlike bare wire hooks. S-hooks are made from bulkier wire, which is formed into a deep hook that won't come unattached. So, when transporting your delicate cargo, tie down with confidence and use a quality cam strap from US Cargo Control. All of our straps are labeled with their working load limit to meet CVSA guidelines, DOT regulations, and WSTDA, CHP & North American Cargo Securement standards. The hook or end fitting is generally the weakest part of a cam assembly, and thus determines the assembly's work load limit. When tying down an item, make sure the total work load limit of the strap(s) you are using equals or exceeds the total weight of the item(s) you are tying down. Assembly Break Strength = 1,200 lbs. Work Load Limit = 400 lbs. Great for delicate cargo - Cam straps will not tighten further once pulled snug. Industrial grade, yellow polyester webbing is weatherproof and resistant to abrasion.